Step aside handstick vacuums, there’s a new kid on the block that doesn’t just vacuum, but can mop as well, to help decrease cleaning time. LG’s A9 Ultimate CordZero is like the name implies – the “ultimate” cleaning bud for your home. Whether it’s your kitchen or bathroom floors, it’s common to do a quick vacuum before you get the mop out, so now you can have the two appliances in one. With a price tag exceeding $1,000 perhaps it’s not for everyone, but let’s investigate its design and features to find out if it’s worth it. What is the LG A9 Ultimate CordZero handstick? Power Drive Nozzle: the direct drive motor inside the Power Drive Nozzle is stated to rotate the roller while vacuuming to help provide effective particle pick up. One Touch Control: On, Off and power levels including ‘Turbo’ mode can be selected with the touch of a thumb. 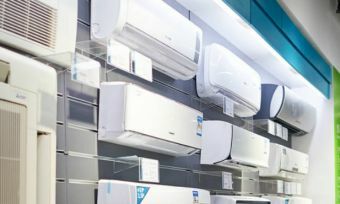 5 Step Filtration System: its air filtration system is boasted to remove the majority of dust particles from household surfaces down to 2.5 microns in size. Larger particles are separated and deposited in the dust bin, while finer dust is filtered and captured in the filters. Dual PowerPack: boasted for up to 80 minutes of runtime. That’s a lot! AEROSCIENCE: is the name given to LG’s air flow vacuum technology claimed to use mini whirlwinds of air to separate out dust particles. 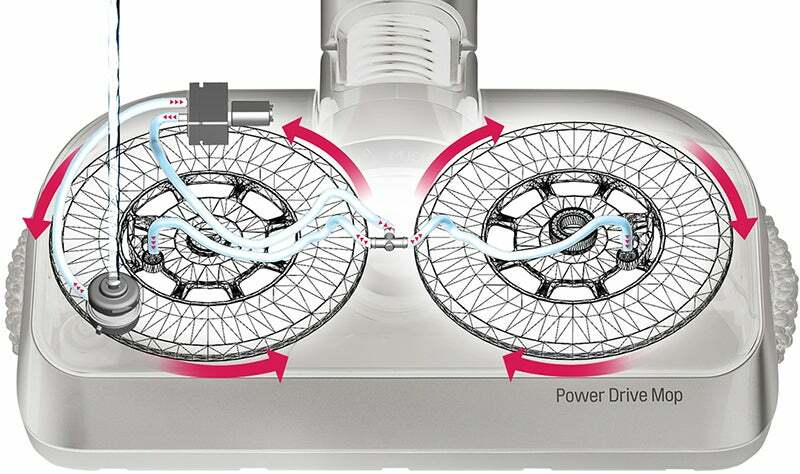 The LG Inverter Motor rotates at high speeds, creating rapid air flow inside its cyclone chambers, according to LG. These features are available across a number of vacuums in the A9 range. Claimed to reduce cleaning time, LG’s Power Drive Mop allows you to vacuum and mop at the same time. This is only available with the LG CordZero A9 Ultimate handstick. It’s designed with an ‘Automatic Water Supply System’, to keep the mop pad damp. It also has a ‘3-Step Water Control’ system, boasted to apply the appropriate amount of water via low or high mode or shut off the water supply altogether. The tank can be detached from the cleaning head for easy cleaning and refilling. How long does the LG A9 Ultimate battery last? LG’s A9 Ultimate vacuum comes with a dual power pack to provide up to 80 minutes of runtime in total, according to the brand. This is when the vacuum mode is set to ‘normal’ and you’re not using the Power Drive Nozzle. With the Power Drive Nozzle, however, the total run time with the two batteries decreases to 60 minutes. The batteries are interchangeable and rechargeable. They’re claimed to be ease to swap – simply push the buttons on both sides and slip the battery in or out. The A9 Ultimate is stated to be height adjustable and ergonomically balanced. The telescopic pipe can be adapted to four different lengths while its Opti-balanced Handle has been ergonomically designed to provide comfort and reduce muscle effort while vacuuming, according to LG. For charging and storing options, there are three possible ways to do so including a wall-mount mode, floor-standing mode or compact mode. LG’s ‘Floor-standing mode’ is available with a number of other models including A9ULTIMATE, A9ADVANCED, A9MASTER2X, A9MULTI2X, A9PETNBED2X, A9ESSENTIAL and A9SINGLE models. In terms of maintenance, its design helps to make it simple. You can expect a removable cleaning roller that you can slide out and clean, plus an easy to empty dust bin. It also features washable filters. Easy roller removal: remove the cleaning roller by turning the bottom lever and sliding the roller from the housing. Easy emptying: empty the dust bin by pushing the dust bin release button. Ease filter cleaning: separate the filter from the body by turning the exhaust cover, without disassembling the vacuum. The metal filter, cloth pre-filter and the fine dust filter can all be removed and washed in water. Leave the filters to dry completely before placing them back in the vacuum. How much does the LG A9 Ultimate cost? LG’s A9 Ultimate handstick with LG’s mopping feature costs $1,199 RRP. This is a hefty price to pay but keep in mind that you’re getting two appliances in one. There are currently five models available within the A9 range that cost between $699 and $1,099 RRP. However, these don’t feature LG’s Power Drive Mop. Should I buy the LG A9 Ultimate vacuum cleaner? Being able to vacuum and mop with one tool will certainly be convenient for some. If your home features a number of different floor surfaces, then perhaps this might be a handy way to cut cleaning time, especially if you usually vacuum an area before you mop. There are also numerous attachments that it comes with to help clean a range of other spaces, from the couch to your car. However, the convenience comes with a price. While it’s pretty much what you can expect to pay for an advanced handstick model these days, it might be way out of your budget. If this is the case, there are plenty of other options to check out. Nevertheless, LG is a well-known brand in the world of vacuums, aiming to improve and innovate with its range. This new vacuum is certainly innovative, but how much are you willing to pay for it?